The Roseville Pottery Company was an American pottery manufacturer in the 19th and 20th centuries. Though originally simple household pieces, the design of the pottery was popular with the American Arts and Crafts movement and pieces are now sought after by collectors. 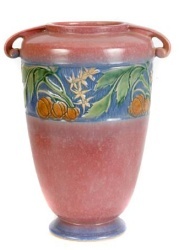 Pictured right: A Roseville glazed earthenware two-handled vase retains foil label, together with a Red Wing glazed pottery vase, impressed RED WING USA 413 heights 12 1/2in and 14 1/4in.Sold for $540 at Bonhams, Los Angeles, Nov 2008. The company was founded by J.F. Weaver in Roseville, Ohio in 1890. It was incorporated in 1892 with George Young, a former Roseville salesman, as secretary and general manager. Under the direction of Young, the Roseville company had great success producing stoneware flower pots and other practical household items. In 1895, the company expanded by purchasing Midland Pottery, and by 1896 George Young had amassed a controlling interest in Roseville Pottery. In 1898, they purchased the Clark Stoneware Company in Zanesville, and moved the headquarters there. 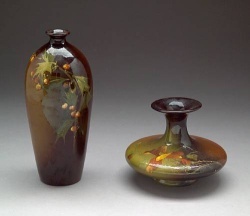 Pictured left: Two Roseville Rozane glazed pottery vases early 20th Century. The first of ovoid form decorated with a large holly sprig on a shaded brown ground; the other a squat ovoid form decorated on the body with a Mulberry sprig on a shaded brown round, each impressed ROZANE and numbered 810 RPCO 6 and 353 RPCO 1 E respectively. Heights 10 1/4in and 6in.Sold for $359 at Bonhams, 2006. 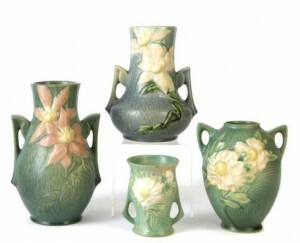 In 1900 George Young hired Ross C. Purdy to create the company’s first art pottery line – Rozane. The Rozane art line was designed to compete against Rookwood Pottery’s Standard Glaze, Owens Pottery’s Utopian, and Weller Pottery’s Louwelsa art lines. The name Rozane was created as a contraction of “Roseville” and “Zanesville”. By 1901, the company owned and operated four plants and employed 325 people. Frederick Hurten Rhead was the art director of Roseville between 1904 and 1909. He is associated with the Della Robbia line. One of Rhead’s vases holds the record as the most expensive piece of American art pottery: however, this is a piece from the studio pottery which Rhead established in California years after he left Roseville. Frederick’s brother Harry Rhead stayed on at Weller. Pictured right: RHEAD SANTA BARBARA Tall vase etched with a stylized landscape. 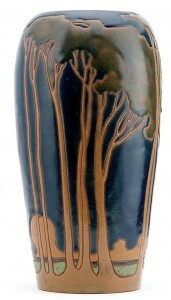 (An extraordinary example, this vase is certainly an iconic Arts and Crafts piece). A few hairlines. Stamped medallion of potter at kiln. 11 1/4″ x 6″. .Sold for $516,000 at Rago Arts & Auction Center, March 2007. Frank Ferrell became the art director for Roseville in 1917 and was responsible for creating many of the most popular Roseville designs. Among the most popular designs created by Roseville are Blackberry, Sunflower, and Pinecone. Following World War II, the use of synthetic materials like melamine resin in dinnerware caused a decline in the pottery industry. Roseville Pottery produced its final designs in 1953, and the following year their facilities were bought by the Mosaic Tile Company. Since the company closed, Roseville pottery has seen two distinct revivals: one with baby boomers in the 1970s, and again in the late 1990s and early 2000s during the Mission Style revival. Pictured left: Roseville glazed earthenware vases in the Clematis and Peony patterns 1940s comprising two Peony, shapes #57 and #58 and three Clematis, shape #’s 108-8 and 106-7. Sold for US$ 457 at Bonhams, Los Angeles, Oct 2009. Today, many Roseville styles remain relatively common while rare pieces can fetch hundreds or even thousands of dollars. Because Roseville’s designs were so influential, replicas and counterfeits are common, and the wide variety of kiln markings—or the lack thereof—on genuine pieces can be confusing for collectors. Popular Roseville Patterns include: Apple Blossom, Artcraft, Artwood, Aztec, Azurean, Baneda, Bittersweet, Blackberry, Bleeding Heart, Bushberry, Capri, Carnelian, Cherry Blossom, Chloron, Clemana, Clematis, Columbine, Corinthian, Cosmos, Creamware, Cremo, Cremona, Crocus, Crystal Green, Crystalis, Dahlrose, Dawn, Della Robbia, Dogwood (Smooth), Dogwood (Textured), Donatello, Earlam, Early Carnelian, Early Velmoss, Egypto, Roseville Patterns, A-E, , Falline, Ferella, Florane, Florentine, Foxglove, Freesia, Fuchsia, Fudji, Futura, Gardenia, Imperial I (Textured), Imperial II (Glazes), Iris, Ivory, Ixia, Jonquil, Juvenile, La Rose, Laurel, Lombardy, Lotus, Luffa, Roseville Patterns, F-L, , Magnolia, Mara, Matte Green, Mayfair, Ming Tree, Mock Orange, Moderne, Mongol, Montacello, Morning Glory, Moss, Mostique, Normandy, Olympic, Orian, Pauleo, Peony, Pine Cone, Poppy, Primrose, Raymor, Rosecraft, Rosecraft Hexagon, Rosecraft Panel, Rosecraft Vintage, Rozane, Rozane 1917, Rozane Patterns, Russco, Roseville Patterns, M-R, , Savona, Silhouette, Snowberry, Sunflower, Sylvan, Teasel, Thornapple, Topeo, Tourmaline, Tuscany, Velmoss, Velmoss Scroll, Victorian Art, Vista, Volpato, Water Lily, White Rose, Wincraft, Windsor, Wisteria, Woodland, Zephyr Lily. Background Roseville Pottery History Copyright (C) 2000,2001,2002 Free Software Foundation, Inc. 51 Franklin St, Fifth Floor, Boston, MA 02110-1301 USA Everyone is permitted to copy and distribute verbatim copies of this license document, but changing it is not allowed.